Whether you are going gluten-free by choice or for health reasons, there are so many great recipes out there that will help you forget about that pesky protein. Pizza is one of the foods I can't live without. Truth be told, I prefer thin crusted gluten-free pizza over the thick and chewy variety. The flavor of the toppings really shine and I am left with of satisfaction as opposed to heaviness. 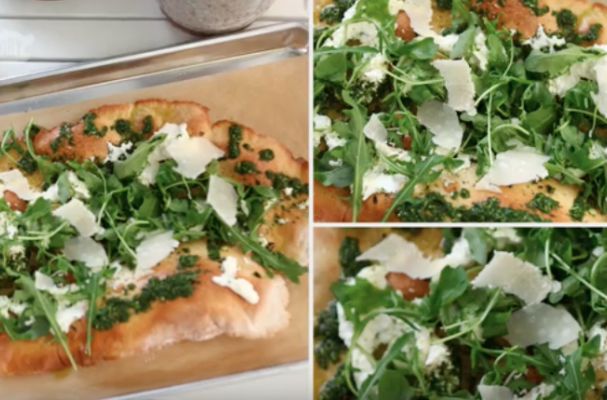 This gluten-free pizza recipe is topped with homemade ricotta, fresh pesto, peppery arugula and a few parmesan cheese shavings. You can even add a few thin slices of prosciutto for an additional salty bite. If you are a pizza lover, this is a must-try recipe.